With Bon Bon Candies Build a Box you can select from two to four flavors to create your very own special assortment of Bainbridge Islands Famous Fudge. All our fudge comes in a one pound gift box and are $16.00. 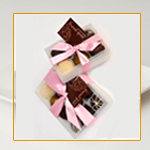 Select from two flavors to create your very own special assortment of our famous fudge. Select from four flavors to create your very own special assortment of our famous fudge. Each flavor is 1/4 pound.